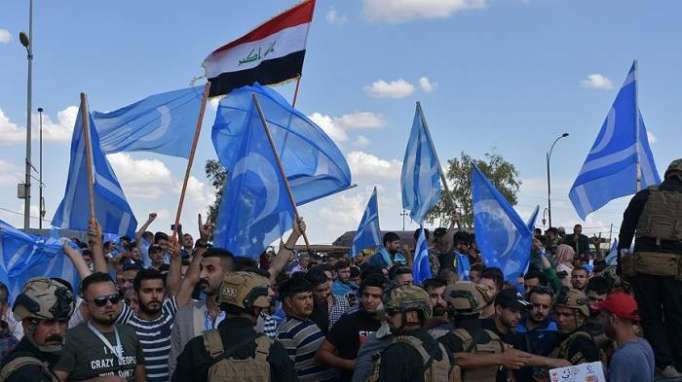 Arab and Turkmen protesters have been demonstrating outside the Iraqi electoral commission offices in Kirkuk for ten days straight, chanting “down with the commission” and demanding a manual recount of votes following the controversial outcome of the May 12 election. The protesters have blocked the main Kirkuk-Baghdad road. “It has been ten days, and our protest is still continuous. We are demanding that our votes be counted manually. None of those present here are willing to leave if our demands aren’t met. Not only for ten days, even if it takes ten months,” Hashim Hussein, a Turkmen resident of Kirkuk, told Rudaw. The Turkmen and Arabs of Kirkuk each obtained three seats on May 12, up from two seats each in the previous election. However, they are not satisfied with the result and have accused the Patriotic Union of Kurdistan (PUK) of voter fraud. The PUK obtained six seats, down from eight Kurdish seats in the previous election. “We are demanding our rights, votes, and the votes of our people, the votes stolen by the not-independent commission. In order to regain our rights, we will be here not for ten days but for ten years,” another Turkmen resident of Kirkuk told Rudaw. The commission has previously said its employees are being held as virtual hostages, and that its warehouses are surrounded by gunmen. It has called on security forces to protect its staff. “The people today want their votes retrieved. They will remain on the street until that day. They are demanding their rights. If the fraud isn’t disclosed, then the provincial council elections will be weak,” Hassan Turan, head of foreign relations for the Iraqi Turkmen Front, told Rudaw. “These protests in the streets in front of the [commission] offices will continue and it will get larger by the day until they regain their rights. The demand of the protesters is very simple, and it is the retrieval of the stolen votes. I don’t know why the commission insists on turning down all these demands,” Ismael Hadidi, an Arab Sunni candidate who failed to secure his seat, told Rudaw.